As people on Earth were celebrating Valentine’s Day over the weekend, a lonely space probe was orbiting a large hunk of ice and rock floating in outer space. The European Space Agency’s (ESA) Rosetta spacecraft has spent the last six months orbiting Comet 67P/Churyumov-Gerasimenko (comet 67P for short), busily taking pictures of the rocky terrain and recording the comet’s activity as it approaches the Sun. At 8:41 a.m. EST (12:41 GMT) on Feb. 14, the spacecraft flew over a region on the comet’s larger lobe, known as Imhotep, at an unprecedented 3 miles (6 kilometers). 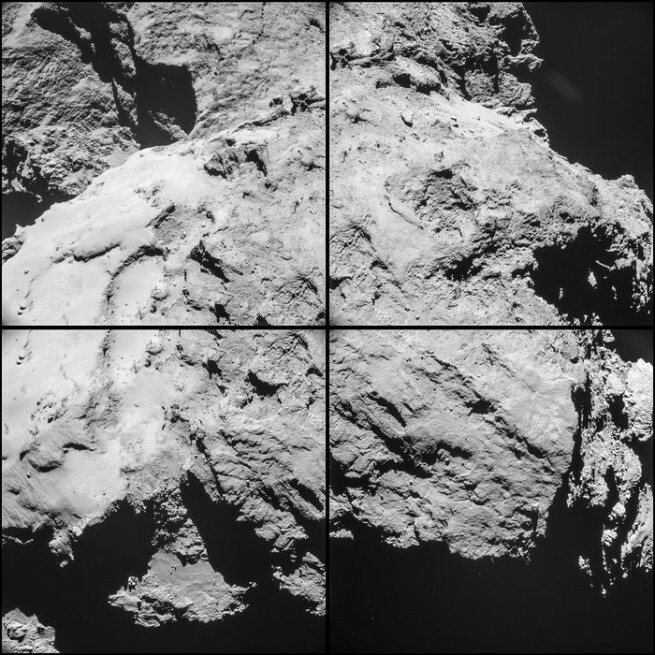 Rosetta’s NavCam documented the flyby with images revealing the comet’s contrasting terrain — highlighting layered and fractured surfaces against regions of smooth, dusty terrain. Boulders of various shapes and sizes can be seen scattered across the surface. The largest boulder discovered, dubbed Cheops, is located in the upper right hand corner of the featured image. In addition to the detailed images, flybys like this permit the spacecraft’s instruments to take measurements of the comet’s coma (atmosphere), and to understand the relationship between the comet’s activity and its coma. Currently Rosetta is conducting a new phase of observations involving flybys at varying distances — between 9 and 62 miles (15 and 100 kilometers). The further away the spacecraft is from the surface, the broader the view of the comet’s nucleus, its coma, and how the coma changes as the comet moves toward perihelion (closest point to the Sun). Right now, the Rosetta spacecraft is 214 million miles (345 million kilometers) from the Sun; in August, at perihelion, the comet and Rosetta will be 115 million miles (186 million kilometers) from the Sun. While the Rosetta spacecraft is busy orbiting comet 67P and beaming back precious data, scientists here on Earth are busy tinkering with ice and organics in the lab in an effort to better understand the nature of comets. Astronomers experimented with an icebox-like instrument, called Himalaya, and believe they know why comets have a hard, outer crust. Thanks to Himalaya, the researchers discovered that fluffy surface ice would crystallize and harden as the comet heated on its approach to the Sun. Crystals of water-ice would form, becoming denser and more structured as other organic molecules would be pushed to the surface, resulting in a crunchy crust littered with organic dust. 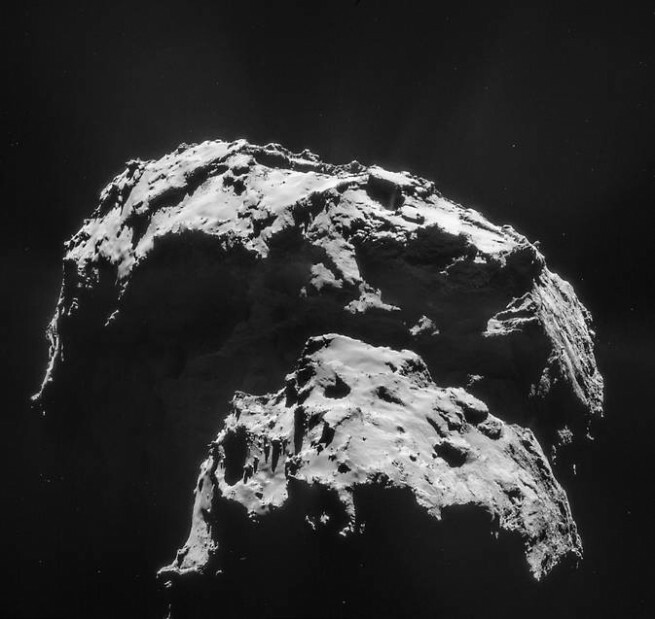 Scientists already knew that comets have soft interiors and seemingly hard crusts. NASA’s Deep Impact and the European Space Agency’s Rosetta spacecraft both inspected comets up close, finding evidence of soft, porous interiors. 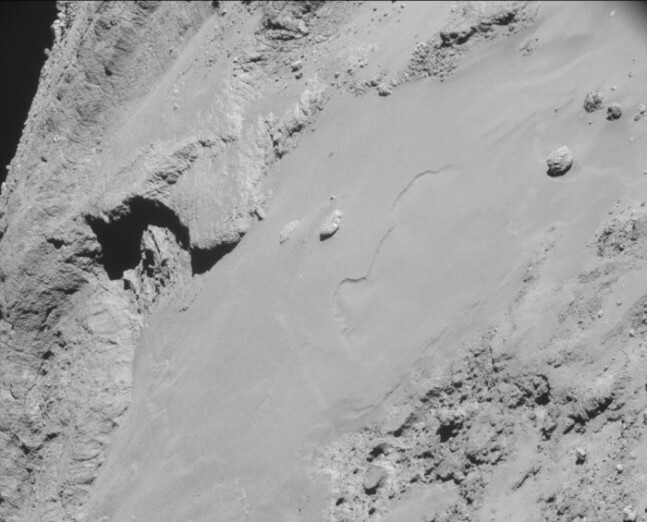 Last Nov., Rosetta’s Philae probe attempted to make the first ever landing on a comet’s surface. Due to the extremely hard surface, the lander bounced several times and is hibernating in the shadows somewhere on the comet’s surface.The Deep Impact mission had also observed black, soot-like coats of comets, made up of organic molecules and dust. Despite everything we now know about comets, the exact composition of the crust and how it forms still remains a mystery. In the latest study, researchers used amorphous, or porous ice, which is what comets are thought to be composed of, to make a crystallized comet crust model. On Earth, all ice is in the crystalline form, as our planet is not cold enough to form amorphous ice. Even a handful of loose snow is in the crystalline form, but contains much smaller ice crystals than those in snowflakes. 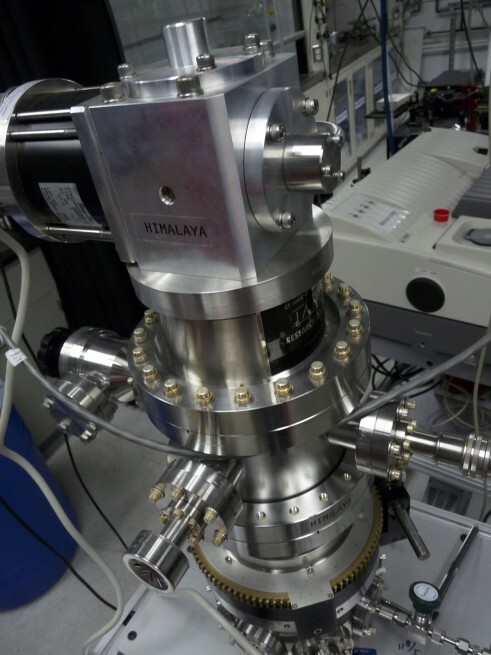 Gudipati and Lignell used the Himalaya instrument to slowly warm their amorphous ice mixtures from 30 Kelvin to 150 Kelvin (minus 123 degrees Celsius, or minus 190 degrees Fahrenheit), simulating conditions a comet would experience as it approaches the Sun. The ice had been infused with a type of organics, called polycyclic aromatic hydrocarbons (PAHs), which are prevalent in deep space. The results of their experiment were quite surprising. “The PAHs stuck together and were expelled from the ice host as it crystallized. This may be the first observation of molecules clustering together due to a phase transition of ice, and this certainly has many important consequences for the chemistry and physics of ice,” said Lignell. With PAHs ejected from the ice mixtures, the water molecules had room to link up and form the more tightly packed structures of crystalline ice. Understanding how comets are formed is key to understanding the role they played in delivering water and other organics to the early Earth. Data from the Rosetta mission indicates asteroids, not comets, may have been the primary carriers of life; however, the debate is still ongoing and comets could play a part. If scientists can unlock the secrets of these icy bodies, they can unlock the secrets of the early solar system. 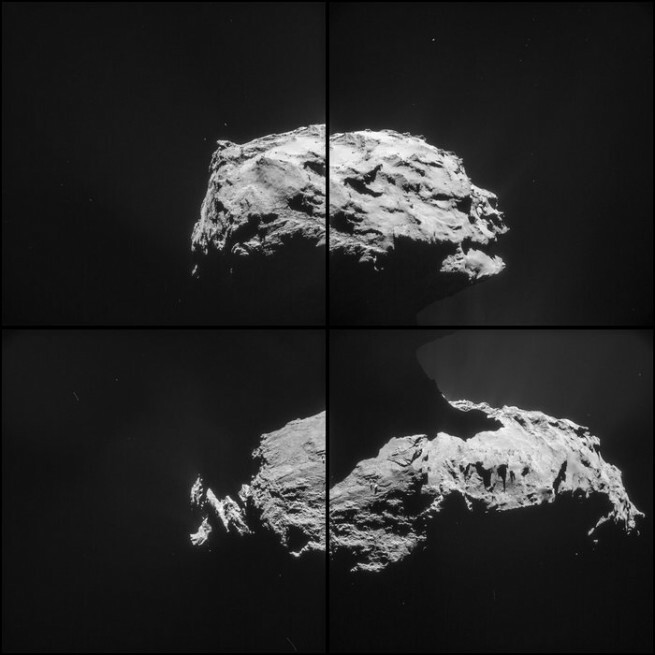 Rosetta is a European Space Agency mission with contributions from its member states and NASA. JPL, a division of the California Institute of Technology in Pasadena, manages the U.S. contribution of the Rosetta mission for NASA’s Science Mission Directorate in Washington. This is how they come from ESA. We will try to edit them if we have time. Thanks!